By teaching students how to produce radio journalism pieces, Making Waves, a new honors course, demonstrates the power of storytelling. 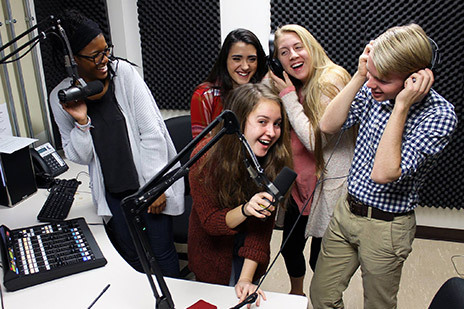 Students in the two-credit hour course develop writing, interviewing, editing and voicing skills to produce radio stories about social issues. Making Waves director Kelsey Kupferer believes that by telling stories, students can advocate for the values and causes that are important to them. “I believe that telling stories and listening to stories—if that’s through journalism, music, documentary film or just informally around our kitchen tables—are powerful tools we can use to build more just communities,” Kupferer says. Before Making Waves was introduced as an honors course at MU in fall 2016, directors Kupferer and Michaela Tucker taught the program at Rock Bridge High School. In 2015, Making Waves transitioned from a high school program to a college course after it received the Interdisciplinary Innovations Fund grant. The fund, which is awarded by the MU Information Technology Committee, offers money to student-centered, interdisciplinary projects that demonstrate MU’s leadership in using information technology to develop unique approaches to teaching, research and service. The six students currently enrolled in Making Waves have worked on two major projects this semester. The first is a This I Believe recorded personal essay in which students discuss the values that guide their daily lives. The second assignment asks students to write, report, edit and produce a four-minute feature story about a social issue that is important to them. When the stories are finished, they are published online, archived with MU Libraries and broadcast on KBIA, mid-Missouri’s NPR-member station. While students learn how to produce radio journalism stories, they also explore their personal identities. Throughout the semester, students listen to radio and engage in discussions about race, class, religion, sexual orientation and gender identities. Kupferer hopes that the assignments students work on in Making Waves will help them develop self-authorship, which is a student’s ability to define their own values and beliefs instead of only accepting what authority figures say. She believes Making Waves gives students the chance to practice self-authorship by encouraging independence and creativity.